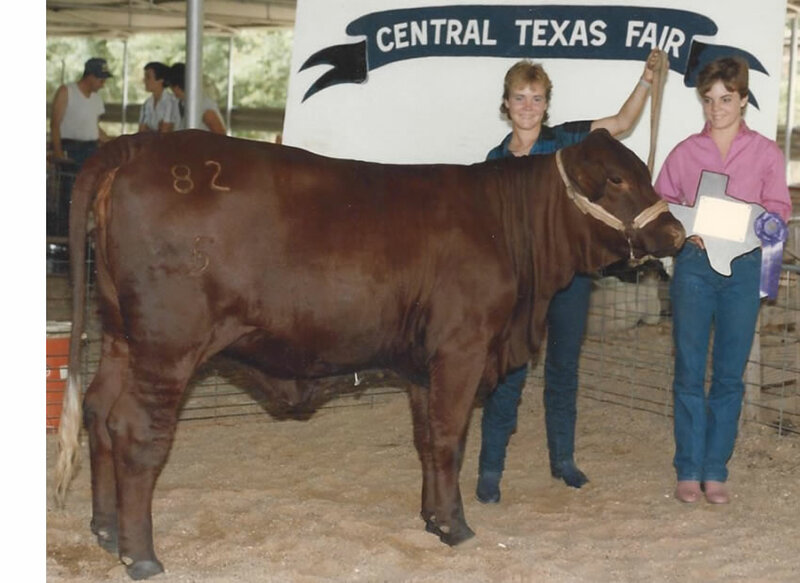 Bill Barrett got his first taste of Santa Gertrudis genetics when his father used a Gert bull on his herd of commercial cattle in 1958, the year Bill graduated from Waco High School and headed off for Texas Tech. At Tech, Bill majored in bull riding, saddle bronc and dancing to Hoyl Nix’s band as a member of Tech’s rodeo team. Perhaps, coincidentally, he received an actual degree in Animal Science, graduating from Texas Tech in 1963. Following his graduation and a bit of time rodeoing while working on his Master’s, Bill was employed by SGBI as a classifier. That was when R.P. Marshall was the “boss” in Kingsville and cattle were transferred by “sales records” using a #2 pencil. Among his cohorts in Kingsville were Buddy Smith, Bob Blackbird, Jim Charlesworth, Walt Stephens and other colorful characters. At that time, classifying Santa Gertrudis cattle meant traveling all over the United States and around the world inspecting herds on virtually every continent—making certain the Standard of Excellence was met and maintained. 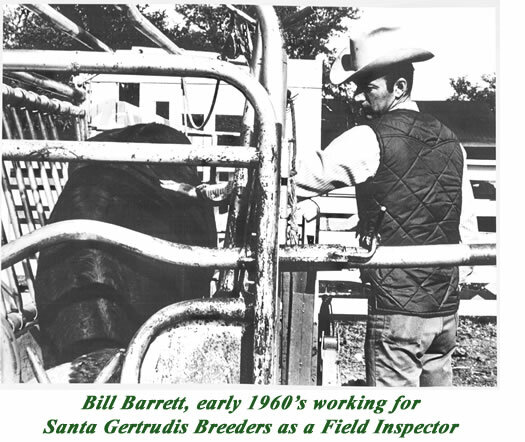 During his tenure at SGBI, Bill formed friendships with Santa Gertrudis breeders, both domestically and abroad, that have lasted almost half a century; and his relationships with fellow classifiers—both those with whom he worked and others who came before and after his time at SGBI—have provided memories that are shared over and over again when the “guys” get together for classifiers’ reunions. One of the most special friendships of Bill’s life was forged with John Wood, whom Bill met at Tannehill Cattle Company in California. When Bill left SGBI in 1968, John and his wife Helen moved to Valley Mills, Texas to work with Bill when he opened his custom-fitting service known as the Bill Company. Wearing the emerald green satin show shirts, appliqued on the back with a white four-leaf clover and the embroidered Bill Company logo, Bill and John went on to build a very successful business that carried them to Santa Gertrudis shows all across the nation and in Mexico. Helen Wood was an integral part of the show team which soon grew to employ many other people. They built their show barn, holding pens, and exercise runs. With the help of a local welder and good friend, they also built their own show trailer. They showed their first Grand Champion at the National Western in Denver in January 1970. Later on, as the business grew, they purchased a used Peterbilt semi and several cattle trailers. At the height of its success, Bill Company was roading show cattle in two semis, loaded with the best Santa Gertrudis in the breed. As all this was happening, Bill finally met and married a “city girl” he found in Houston with the help of Buddy and Larue Smith. Kati had gone all through school in Huntsville, Texas with Buddy and Larue and they convinced her to go on a blind date with Bill—under duress. Kati accepted only when she found out the date would involve a party at the Petroleum Club in Houston (the swankiest venue in the city). It was love at first sight for Kati and she skipped work the next day for the first time in her life and attended the Nine Bar Sale with a man she thought was a bill collector because of the Bill Company name of his business. Even though Buddy warned Kati that Bill Barrett was not the marrying kind and she should be very careful, they were married in August 1969 after having known each other for only four months. Two weeks after their marriage, Bill and Kati hosted the first Santa Gertrudis School of Knowledge in partnership with Roger Letz, owner of the Santa Gertrudis Journal. 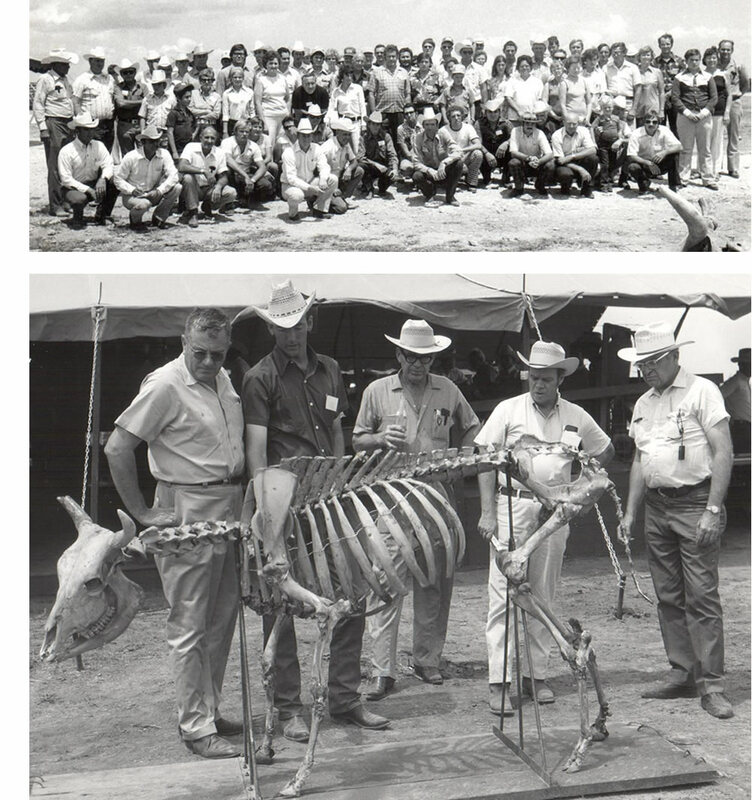 The successful school became an annual event and provided practical knowledge for interested cattlemen. The schools’ faculties were always made up of practical, successful ranch managers and owners. Bill put together a herd of cattle that represented the kind of genetic problems that every cowman needed to recognize and avoid introducing into his herd. He had cattle in the example herd that had wry noses, dwarfism, undesirable underlines, splayed feet and hooves, inadequate bone, too much white, bad udders, etc. The faculty members would point out the problems and then the Bill Company show cattle would be used to pinpoint what desirable Santa Gertrudis bulls and females should look like. The school was held for many years in Valley Mills and also in South Africa and Australia. Additionally, a school was presented to a contingrent of Brazilian breeders who traveled to Texas in 1975. Faculty members from the United States made the overseas trips, cattle were provided by ranchers in the host countries…and it was a good run! Bill’s family grew rapidly and soon Bill was supporting a wife and three daughters! He was constantly on the road showing cattle and doing sale management and herd consultant work, but his favorite place to be was and is at home. The business also grew and Bill Company showed many, many champions over the years. One of Bill’s greatest pleasures was working with his father Coy and his uncle G.D. Barrett in the founding and operating of Wortham Bend Farms on land that had been in his family for over 100 years. 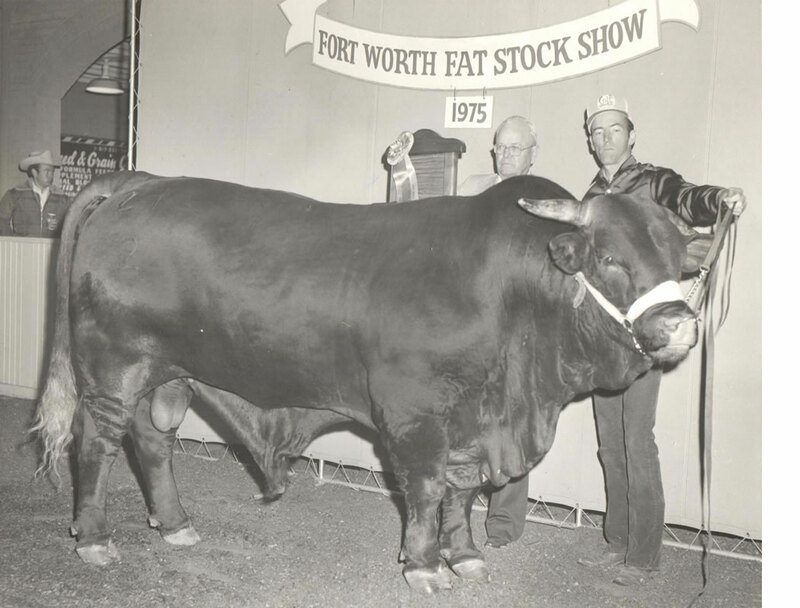 Wortham Bend Farms bred and owned a bull, Atlas 21/2, who was two-times National Grand Champion Bull. Kati remembers the day Bill discovered the bull calf shortly after his birth. Kati remembers he came running into the show barn late one afternoon when we were all feeding and said, "I have just seen a National Champion Bull born, and I’m gonna name him Atlas.” Bill probably sees raising, fitting and showing that bull as one of his greatest accomplishments. During their many years of showing cattle, John and Bill fitted and showed Champions for many Santa Gertrudis breeders and they enjoyed the spirited competition of the showring. Following in their dad’s footsteps, all three of the Barrett daughters took their turns in the showring as well and Bill was always telling them they had to learn to stand at the bottom of the line as graciously as they would if they were taking first in class. The whole family became active in the Junior Santa Gertrudis Association, attending all the National Shows, making wonderful lifelong friendships and taking leadership roles. Those family memories are cherished. 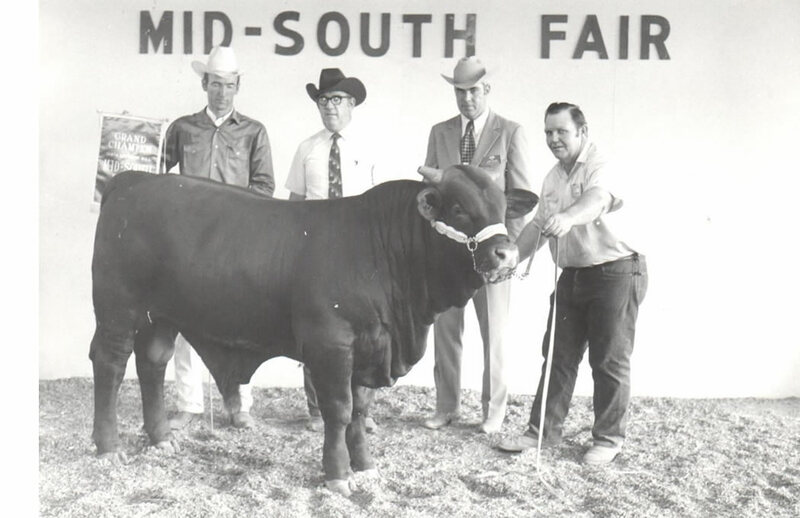 After the deaths of Bill’s dad and uncle, a dispersal sale of Wortham Bend Farms’ cattle was held in 1980 and Bill and Kati and their girls purchased 14 females and the Atlas bull out of that sale to form the foundation herd that became known as Five Oaks Ranch. 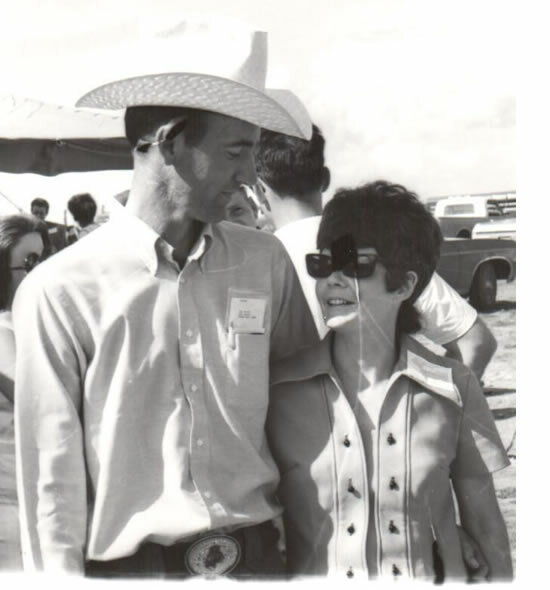 John and Helen Wood left Bill Company to manage the beautiful herd of Santa Gertrudis cattle for Clarendon Plantation in South Carolina and Bill began to focus on his own ranching operation and other business interests. Bill Company continued to operate, branching out into a livestock carrier business that had as many as 60 cattle trucks on the road, hauling primarily for Clifton Cattle Company. In 1983, Bill gave Kati a special birthday present—he purchased the local Valley Mills Tribune, and put her in the newspaper business! He apparently believed her days as a stay-at-home mom should end and she should run the local newspaper, utilizing her skills as a writer. 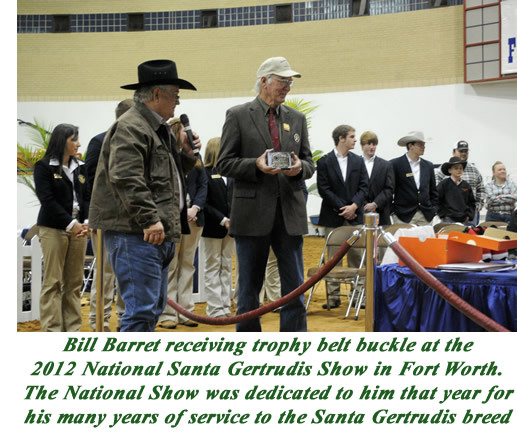 After about a month of operation, Bill decided it would be a good idea to get more use out of the typesetting equipment, and thus was born the Santa Gertrudis Tribune, a tabloid-size publication, published twice monthly and devoted exclusively to news and photographs of virtually all Santa Gertrudis events. The publication lasted 14 years before printing its final issue. The covering of all those events put Bill back on the road again, but those years were exciting and included covering Santa Gertrudis events in Hawaii, Australia and South Africa, as well as all over the United States. Operating Five Oaks Ranch, herd number 1900, became Bill’s focus and Kati took over all the clerical duties associated with running a purebred herd. In 2003, they expanded their cattle operation by purchasing the entire herd of Five B Ranch cattle from the family of J.W. Burden in Iredell, Texas. Hosting an annual production sale had always been a goal of Bill’s and on June 1, 1991, Five Oaks hosted the first of its 21 annual sales, held on the first Saturday in June every year. Premier President Chris Taliaferro served as the sale’s auctioneer for most of those years. Believing that the future of our breed rests in the capable hands of Santa Gertrudis Junior members, in 2003 Bill added another feature to the annual sale event—a drive-up junior heifer show. Each year, $3,000 in scholarship funds are made available to the highest placing eligible heifers in the junior, yearling and senior divisions of the Five Oaks show. To be eligible to win scholarship money, a heifer must either be purchased from Five Oaks or Five B Ranch or carry those genetics in the first generation of the heifer’s pedigree. To date, $13,000 has been paid to junior showmen entering their first year of college and funds are still banked in the amount of $8,000 at this time, awaiting further high-school graduations of junior showmen who have qualified for scholarships. Bill and Kati are ever so grateful to Jane and Suzanne Fulton who serve as bookkeepers for the show each year. Everyday of his life, Bill Barrett lives and breathes Santa Gertrudis cattle. His belief in the cattle and their ability to perform continues to stir his blood and get his feet moving every morning. Surpassed only by his love for God and his family, Bill loves his red cattle. He works too hard and puts too many miles on his dented pickup, but he isn’t gonna change. Everybody who knows him KNOWS THAT! After all, he’s a Santa Gertrudis breeder. Click here to see additional Bill Barrett photos!